Manchester City and Liverpool will discover their respective Champions League and Europa League semi-final opponents in Friday's draws. The Champions League draw will be at 10:30 BST and City, who will be managed by Pep Guardiola next season, could face the Spaniard's Bayern Munich side. Atletico Madrid and Real Madrid are the other Champions League semi-finalists. The Europa League draw will be at 11:30 BST, with Liverpool, Sevilla, Shakhtar Donetsk and Villarreal in the hat. Liverpool beat Borussia Dortmund in a thrilling quarter-final as they came from 2-0 down at half-time to win 4-3 at Anfield and 5-4 on aggregate. Sevilla remain on course for a third successive Europa League victory after overcoming Athletic Bilbao on penalties. 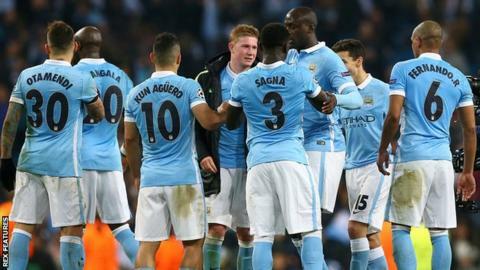 City boss Manuel Pellegrini has played down the prospect of facing Bayern after his side's win over Paris St-Germain. Asked what a tie with Guardiola would mean, Pellegrini said: "For me, exactly the same. It doesn't matter." Atletico were beaten by Madrid rivals Real in the 2014 final and may get a chance to avenge that defeat in this season's competition. "We never have anything easy," said Atletico boss Diego Simeone. "Manchester City have enormous economic power, extraordinary players, and look at the history Madrid and Bayern have. "They are all great teams for us, but for Atletico Madrid to be among the four best in Europe is a big step."